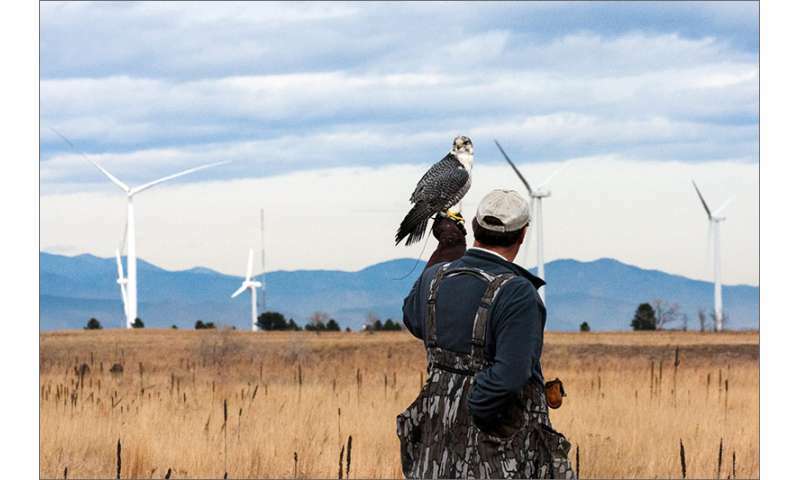 A trained falcon named Houdini darts and soars next to a wind power plant in the shadow of the Colorado Rockies, gathering radar data that could someday save the lives of his avian brethren. Peregrine gyrfalcon Houdini is the VIP guest of the Energy Department's National Renewable Energy Laboratory (NREL), and he performs his strategic flights at the National Wind Technology Center (NWTC), 12 miles north of NREL's main campus. The 15-year-old raptor delights crowds at halftime during U.S. Air Force Academy football games, but his work for NREL may prove to be his career highlight. For his flights adjacent to the NWTC, he is equipped with a tiny GPS device the size of a USB flash drive, about 2% of his body weight. The aim is to use Houdini to teach a radar system to spot birds amongst all the cars, deer, litter, and atmospheric disturbances that make up the returns of the radar system. Wind turbine blades cause a very small percentage of bird deaths annually—domestic cats are the big culprits. But some of the most majestic birds of America fly at the height of those huge turbine blades, so anything that can be done to save some lives is important. Golden eagles, protected under federal law, are among the large birds that could be at risk from wind turbines. The story of the NREL-Houdini connection starts with a Technical Services Agreement between NREL and Laufer Wind, which in 2009 was developing a radar system to detect nearby planes and automatically switch on lights on the turbines to forewarn the pilots. That capability is important, because otherwise the lights have to be on all the time after dark—which can be annoying to neighbors. After that success with that system, the researchers from Laufer Wind and NREL turned their attention to developing a new detection system to try to prevent bird strikes, said Ismael Mendoza, who is NREL's manager for the project. The alternative—mandated in many places—is to station a human being at the wind power plant 24 hours a day, seven days a week, to watch for birds. Laufer was able to piggyback on research being conducted by the University of Colorado, which has permission from the Federal Aviation Administration to fly drones at the NWTC. As the radar scans 360 degrees, it picks up the drone in a small slice of that circle. The radar can use detections from each rotation to track the drone. To learn about birds, why not use a bird? NREL Field Test Engineer Jason Roadman, a licensed pilot, started musing about an alternative. "If they want to learn how birds move through the air, what they really want isn't a drone, it's a bird," he said. That thought came to him in a quiet moment as he was driving home. He remembered years before when he visited a tourist-oriented castle in England, watching a falcon delight the crowd with its aerial maneuverings, before settling back on its handler's leather-strapped wrist. Serendipitously, Roadman's sister was a wildlife biologist. Roadman, who is an avid climber and backpacker, says his sister, Adrian, is the true animal enthusiast in the family. "Is this a completely crazy idea?" he asked his sister. She told him: "No, actually it might work." "Once we learned that it was possible to use a real raptor, that would be a much better target than a drone that is a proxy for a bird," said Eric Laufer, founder of Laufer Wind. So, Roadman got in touch with the Colorado Hawking Club. His luck was still on a roll—their annual picnic was a week away. He showed up and talked to a few of the falconers, ultimately convincing them that his plan could be a net benefit to raptors everywhere. "When we found out what he wanted to do, we were very interested in helping out," Colorado Hawking Club President Deanna Curtis said. 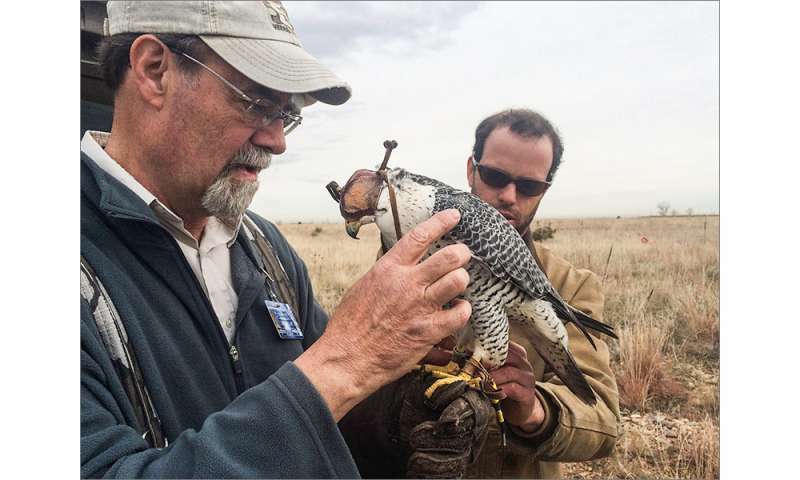 "Falconers have been conservationists for quite some time. The way I look at it, as long as we are all using energy, it is everyone's responsibility to find the best energy source we can." When she heard that Roadman needed a falcon that could fly to the commands of its handler, she immediately thought of Sam Dollar, a world-class falconer who heads the U.S. Air Force Academy's falconry unit. Dollar, Houdini's handler, didn't need much convincing, and volunteered his time gratis. Dollar trains falcons to do laps around a stadium in Colorado Springs filled with tens of thousands of football fans. He knew Houdini was capable of some prolonged flights. Hawkers sometimes send their birds out to catch, say, rabbits and other small wildlife. More often, they teach them to chase a leather ball tethered to a long rope, and then reward them with some food when they've returned with the ball to the leather gauntlet on the handler's wrist. For Houdini's maiden scientific flight, Dollar and Roadman decided on a pet tracker, the kind cat owners use to decipher where Fluffy went last night. They trimmed the edges to make it as light as possible. The device attached to Houdini's foot was light enough because it only had to record data, and didn't need to send the data simultaneously. "They just needed to know where the bird was in time," Roadman said. "They could find that out after the flight." 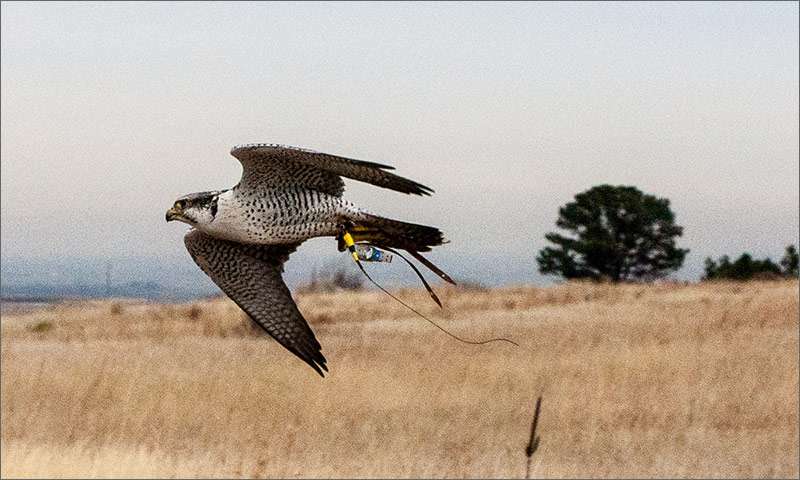 Houdini also had to carry a tiny very high frequency tracker, required on the birds of all falconers so they can be tracked if they don't return. The day of the first flight came, and Dollar twirled the ball to perk Houdini's hunting instincts. Houdini soared in the air, darting and climbing to reach the ball or, perhaps, just to enjoy the sky. Every second he was in the air was a second that the Laufer radar recorded data on his movements—Laufer's radars are connected about 30 feet above the ground. "They're looking for a needle in a haystack," Roadman said. The radars collect a gigabyte of data every minute; the trick is to discern the bytes of data that represent the bird. Learning that the bird was at point X, plus or minus 10 feet, plus or minus one second—and then multiplying that by thousands of data points—helps the radar determine what is and isn't a bird. The ultimate aim is to be able to detect birds soon enough that an alert can be sent to the wind power plant operator in time to shut down the blades. "The more time in the air, the larger your database," Roadman said. Houdini's next flight hasn't yet been scheduled, but Dollar is confident that the falcon can stay in the air even longer next time. For Laufer, the collaboration has been both useful and fun. "Everybody at NREL has been great," Laufer said. Roadman said the falcon project is a career highlight. "It sure beats staring at a spreadsheet full of numbers. One of the cool things about NREL is that every once in a while a project comes along to remind you why you are here."